We're on our fourth entry this year. We typically do journal entries on Thursdays, that way if a student is absent on Thursday, they have Friday to catch up (Fridays we usually do math stations). I'll share some of our first ones in the next few weeks. Today's "Math Journal Sundays" focus is a new entry that isn't in Interactive Math Journal 1 or Interactive Math Journal 2. While problem-solving this week, I noticed my students needed a little extra practice reading the problem and making a plan for solving the problem. So, I brought out the CUBES strategy. 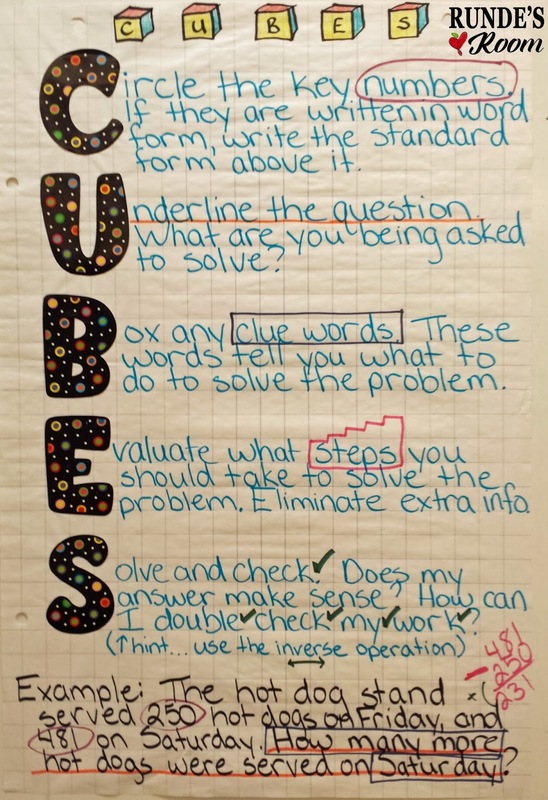 I first made an anchor chart to hang in the classroom and we discussed each step together as I modelled it on the problem at the bottom of the anchor chart. 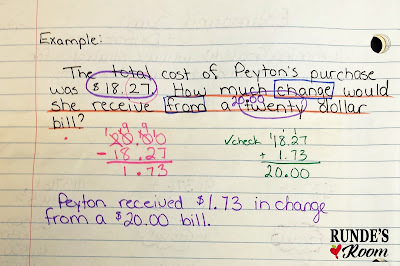 I purposely chose an easier problem to use at the bottom of the chart so all my students could understand the problem and know how to solve it, and we could focus on HOW to use the CUBES strategy instead. We then made an CUBES entry for our math journals. We used a net for a cube (see what I did there?) for the entry (and that way I could also throw in a little extra geometry talk). The top panel had the title, and the 5 remaining panels had the different steps for CUBES. I am a huge fan of colour coding, so we coded each step a different colour on our entry, and those are the colours they will use when working with the strategy. 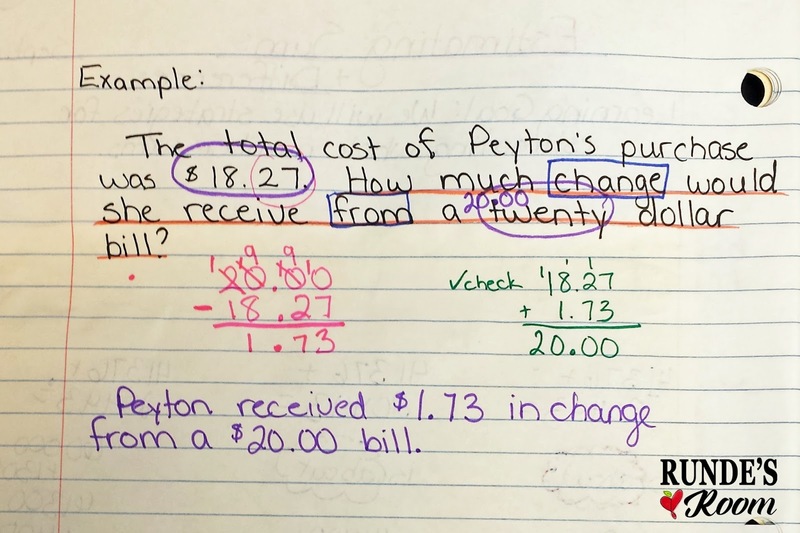 For the left side of the page, we did something different than our traditional left side of the page thinking with reflection question. Instead, we did some application and used the CUBES strategy on two different problems. We worked as a whole group on one problem, and students worked independently on the second problem and then had a peer check their work. And that's that. I'm so happy they have this reference in their journals. 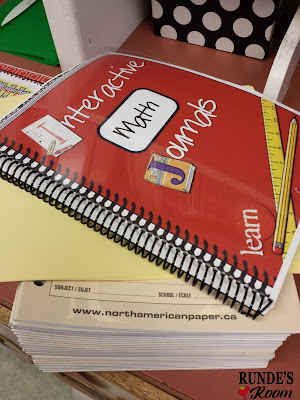 If you're interested, you can check out all my older Math Journal Sunday posts by clicking on the link at the start of this post. Do you mean the net for the cube? I have a book with all the nets, but you could just search one through google. Love the cubing idea. And I think it will help them later on when they are asked to determine what 3-D shape a 2-D net will fold into. That abstract reasoning ability seems like it would develop earlier and more strongly in students who have seen the net in their INB a few times! I love your CUBES problem solving strategy! 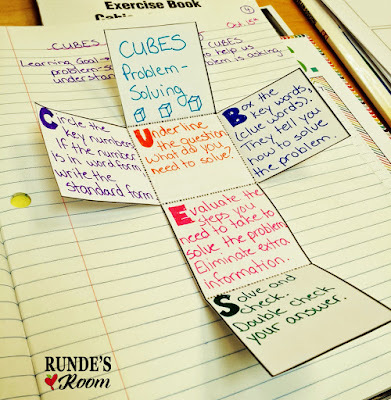 The interactive notebook cube is a great resource for the students- and so cute! 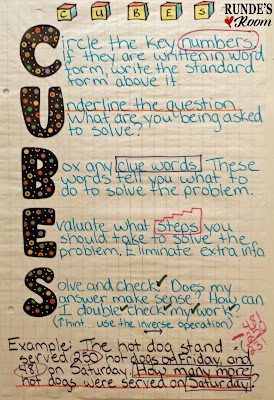 Thanks for sharing this great strategy for problem solving!